Raj Karmacharya, the owner of Overseas Tailor who has fitted suits for NHL legend Joe Sakic. One of Karma’s employees shows off a photo of Joe Sakic rocking one of Overseas Tailor’s suits. Roaming the narrow, bustling passageways of Bangkok’s Khao San Road, a snapshot of a celebrated NHL hockey player’s face stared back at me. 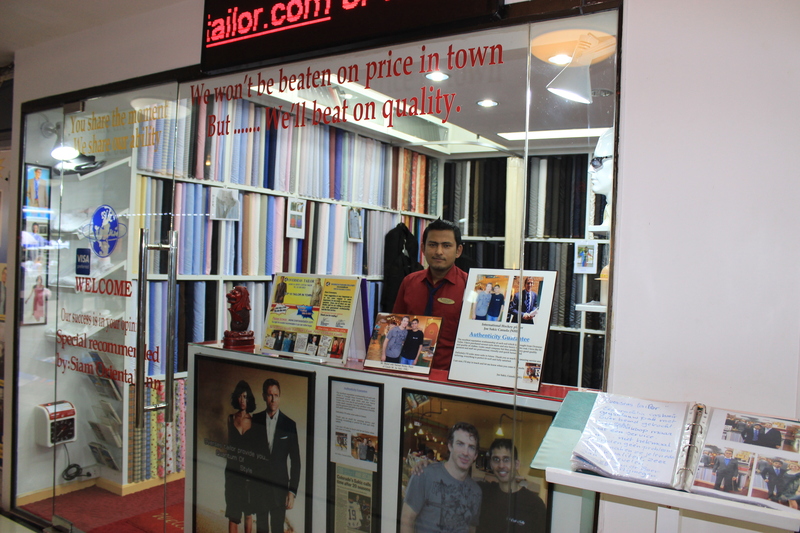 Joe Sakic, the man with the iron wrist shot, former captain of the Colorado Avalanche and two-time Stanley Cup champion is a customer of the Bangkok tailoring outlet I was standing outside of. 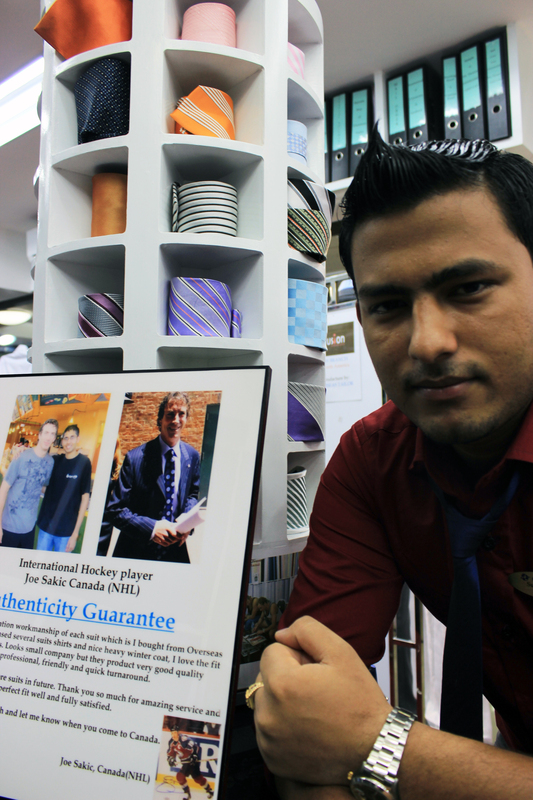 The store, Overseas Tailor, proudly displays several photos of Burnaby Joe shaking hands with employees. The employees even knew Sakic stats. They’re all aware Sakic sipped champagne from the Stanley Cup in 1996 and 2001. Although Sakic’s not there in the flesh and it’s just a photo, I’m impressed that anyone in Thailand even knows what hockey is or has a a clue who Sakic is for that matter. Not just a legend in North America, Sakic’s legacy has apparently stretched all the way to Southeast Asia. 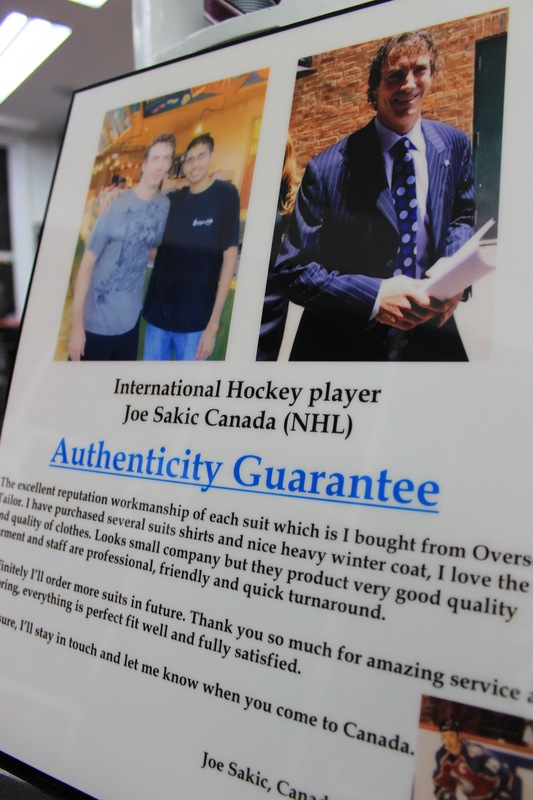 Joe Sakic’s authenticity guarantee of Overseas Tailor’s suits. I acquainted myself with the tailor who met Sakic and fitted his suits. His name is Raj Karmacharya. He goes by Karma. A clean-cut Nepalese businessman in pinstriped dress shirt with a ponytail and glasses, Karma was a stylish fellow who appreciated Canadian’s love of hockey. He actually met Sakic at a coffee shop in Surrey, British Columbia during a business trip to Canada where he has more outlet stores. “You had a cup of Joe with Joe?” I said with a smile, trying to be witty. I couldn’t refrain from the wordplay. No one laughed. I continued the interview. When Karma first met Sakic, he had no idea he was a big-time athlete. “I didn’t know him first of all. I didn’t know Joe Sakic quite famous. Then I measure him and finish everything and I find out he’s that person,” said Karma. Karma thought Sakic had an impeccable fashion sense. “He was so casual. His style was quite good,” said Karma. The exterior of Overseas Tailor proudly displays an enlarged photo of Joe Sakic (bottom right) in Bangkok. Despite all the Sakic photos kicking around I don’t think Sakic has actually been to Bangkok but he still orders his suits from Overseas Tailor’s Thai factory. Aside from Sakic, Karma fits suits for Bollywood actors, European soccer stars and quite a few Canadians. A Regina, Saskatchewan wedding party of the groom and groomsmen hangs near the counter in his quaint shop, too. Karma claims he caters to New Brunswick politicians, including Fredericton’s mayor, too. The suits he fits are made of Kashmir, silk and high-quality cotton. A nice full-piece suit here costs around $250 compared to upwards of $600 in North America. The material is typically imported from India. 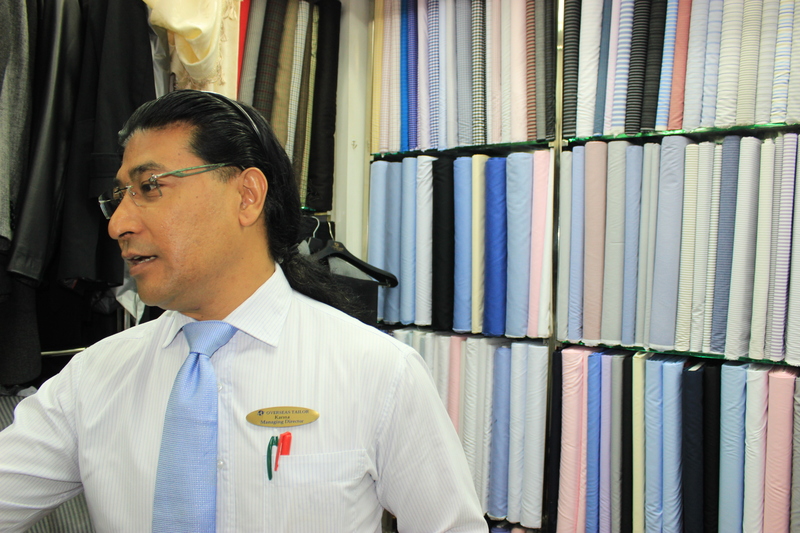 Sam Poudel, who works at VIP Tailor, a few paces from Overseas Tailor, is all too familiar with the legend of Sakic, as well. “He’s a great player and he makes Canadians very happy. ’96 and 2001, eh?” He joked, referencing Sakic’s Stanley Cup years. He used to work for Karma and still maintains a good relationship with the neighboring businessman. Poudel said he tailored suits for another Canadian visiting Bangkok who claimed he caddied Sakic’s golf clubs during a tournament. The caddy was reportedly tipped a $100 by Sakic. It’s funny how hockey connects people even thousands of miles from Canada. I continue my exploration through Bangkok’s backpacker paradise and feel just a little more at home. Neat… But it ain’t no Leader Tip Top Tailors. Bangkok is famous for Men`s fashion and tailors of Thailand is one full stop for men & women clothing where you can tailor suit, shirt, overcoats, tuxedos, jackets, blazers as per you own look that comfortable and help to get your-self personality in the crowd. I went by my friends recomendation above and was super happy, so glad to share.